Old And Overmedicated: The Real Drug Problem In Nursing Homes : Shots - Health News Way too many residents of U.S. nursing homes are on antipsychotic drugs, critics say. It's often just for the convenience of the staff, to sedate patients agitated by dementia. That's illegal. Antipsychotic drugs aren't necessary in the vast majority of dementia cases, gerontologists say. The pills can be stupefying and greatly raise the risk of falls — and hip fracture. (From left) Marie Sherman and her parents, Beatrice and Manuel DeLeon. Antipsychotics, however, are approved mainly to treat serious mental illnesses like schizophrenia and bipolar disorder. 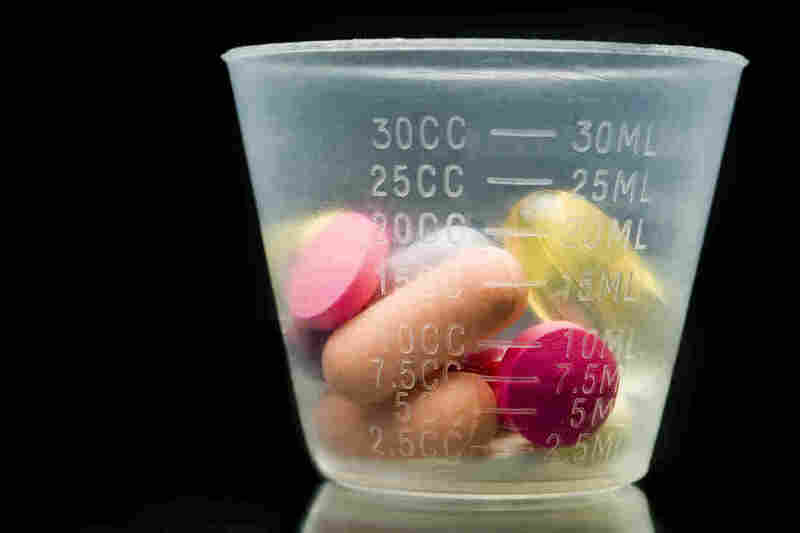 When it comes to dementia patients, the drugs have a black box warning, saying that they can increase the risk for heart failure, infections and death. 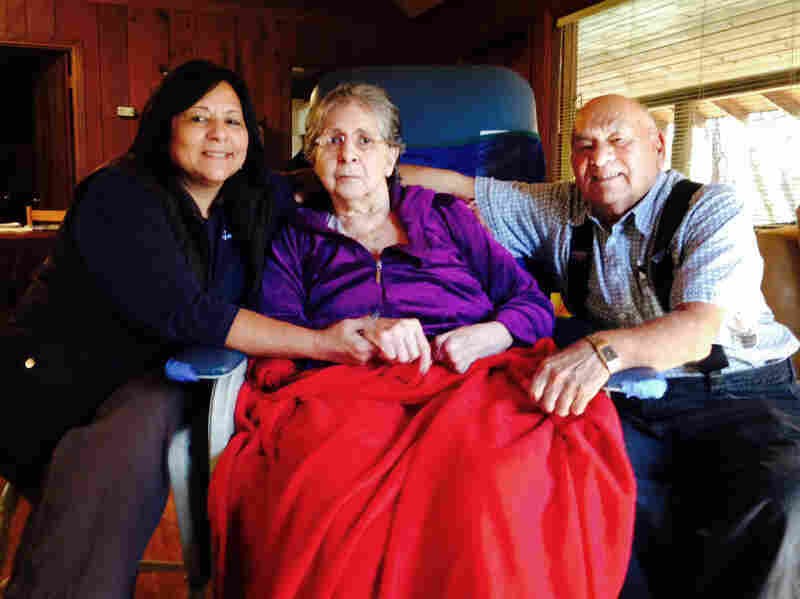 None of this was on Marie Sherman's mind when her family decided that her mother, 73-year-old Beatrice DeLeon, would be better off in a nursing facility near her home in Sonora, Calif. It wasn't because of her Alzheimer's disease, explains Sherman — it was because her mother had had some falls. "We didn't want my dad to try to lift her, and we wanted to make sure she was safe," says Sherman. It wasn't long before the nursing home staff told Manuel DeLeon, Beatrice's husband, that his wife was agitated and they wanted to give her some medication for that. So he said OK.
"They kept saying she was making too much noise, and that they give her this medicine to quiet her down," he says. Federal law prohibits the use of antipsychotics and other psychoactive drugs for the convenience of staff. It's called a "chemical restraint." There has to be a documented medical need for the drugs. "But they just kept giving her more and more," says DeLeon, "and I noticed when I used to go see her, she'd just kind of mumble, like she was lost." The DeLeon's daughter, Marie Sherman, says that when her mother wasn't "lost" she was "out of her skin." "I mean, she was calling for help," Sherman says. "She was praying, 'Our Father, who art in heaven, please, please help me. Please, take me, please, get me out!' "
It turned out Beatrice DeLeon was given Risperdal and Seroquel, which are approved to treat bipolar disorder and schizophrenia. But professor Bradley Williams, who teaches pharmacy and gerontology at the University of Southern California, says antipsychotics should only be used as a last resort, and just for a month or so, before gradually being eliminated. Check NPR's interactive database below to see the history of antipsychotic drug usage at nursing homes in your area and how they compare to national and state averages. Antipsychotic drugs change behaviors, Williams says. "They blunt behaviors. They can cause sedation. It increases their risk for falls." And in the vast majority of cases, the drugs aren't necessary. "If you want to get to the very basic bottom line," he says, "why should someone pay for something that's not needed?" But residents or their guardians may not know that the drug is not needed. And they're rarely told about the serious risks, says attorney Jody Moore, who specializes in elder law. She has sued nursing homes in California for failing to get informed consent when they use antipsychotic drugs, as required by law. "We learned that the families really weren't told anything other than, 'The doctor has ordered this medication for you; please come sign a form,' " says Moore. "And families did." One of her clients is Kathi Levine, whose mother, Patricia Thomas, had Alzheimer's. Despite her dementia, Thomas had been doing fine in 2010: living in a memory care facility near Santa Barbara, walking and talking, dressing and feeding herself. Levine remembers visiting her mother at the facility one day when there was a party going on, with a Hawaiian theme. I know the medications they gave her weren't my fault. But the guilt's still there. It's always going to be there. "My mom was standing up with a lot of the other ladies, doing the hula," recalls Levine. "And she pulled me up off the chair and said, 'Hula with me. It's fun.' And I think that was the last time I remember her having that 'I love my life' kind of look on her face." Not long after that, Patricia Thomas fell and fractured her pelvis. After a brief hospital stay, she went to a nursing home for rehab. "But within a week," says Levine, "she was in a wheelchair, slumped over, sucking on her hand, mumbling to herself, completely out of it, not even aware that I was there." Her mother was so "out of it," she couldn't do the rehabilitation work that was the reason she went to the nursing home in the first place. So they discharged her. That's when Levine first saw a list of her mother's medications. "I literally freaked out," says Levine. "I couldn't believe all of these drugs on a list for my mother." Among them were Risperdal and Haldol, both powerful antipsychotics. Levine tried to slowly wean her mother from the drugs, but Patricia Thomas remained in her wheelchair. She never had another conversation. She was dead in two months. "When you are your parent's caretaker and their guardian, and things like this happen, you feel terribly guilty," says Levine. "I know the medications they gave her weren't my fault. But the guilt's still there. It's always going to be there." So Levine and her attorney, Jody Moore, brought a class-action lawsuit — the first of its kind — against the nursing home, charging wholesale violation of informed consent. Moore is a seasoned attorney but says she was amazed at a deposition she took from one of the doctors, who said "not only do I not get informed consent, but I don't know of any doctor who does, and you're crazy to think that that's my job." The nursing home settled. It's now required to change its practices. An independent monitor will make sure it follows through. But this facility was not out of the ordinary when it came to dispensing unnecessary antipsychotic drugs. In 2011, a government study found that 88 percent of Medicare claims for antipsychotics prescribed in nursing homes were for treating symptoms of dementia, even though the drugs aren't approved for that. So the next year, the federal government started a campaign to get nursing homes to reduce their use of antipsychotics by 15 percent. That 15 percent reduction was supposed to take less than a year. It took almost two. And it still left almost 300,000 nursing home residents on risky antipsychotic drugs. But Beatrice DeLeon is no longer one of them. She's home again with her husband. The family found a state program that sends health aides to the house. And now she can have the kinds of conversations that mean something to her and to her family. "Can you kiss me?" she asks, apropos of nothing. "Of course I can, Mama," says her daughter. Beatrice DeLeon says "thank you." She says that a lot. Currently, she's not taking anything but her Alzheimer's medication. But that seems to be enough, for a life filled with love and gratitude.